Feet can be quite moody: usually the right and left feet are different lengths, they are shorter and narrower in the morning than in the evening, and they’re longer when you’re standing than when you’re sitting or lying down. Feet need the most room when they’re in motion: the toes slide forwards with every step. Children's feet need at least 12 mm (just under 1/2“) of extra space in the toe of the shoe to be able to move unrestrictedly. New shoes can have up to 17 mm (not quite 3/4“) extra “wiggle room”. This way, they should fit well for quite a few months. The ideal shoe for children should be soft and pliable. -Have the child stand on a piece of cardboard and trace the outline of each foot. 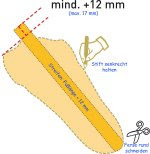 -Add at least 12 mm (just under 1/2“) to the length of the longest toe (for new shoes, add 17 mm, or not quite 3/4“). -You don’t have to cut out the whole template, a strip the width of two fingers is sufficient. If the cardboard strip fits inside the shoe, then the shoe is long enough. Professionals always measure with two hands. To make sure that the toes are not bent in the shoe, press the toes lightly with one hand while you measure the fit with your other hand. Labels: How to measure feet? We offer a wide selection of stylish, comfortable and healthy footwear for infants, toddlers, and young children. In our store you will find shoes from such leading brands as Umi, Primigi, Naturino, Rileyroos, Skeanie, Bobux, Jack and Lily, Beeko, Garvalin, Pediped, See Kai Run, Eleven, Vincent, Tsukihoshi, Livie and Luca, BabyLegs, and many others. We only offer high quality products that are good for the development of your children's feet.